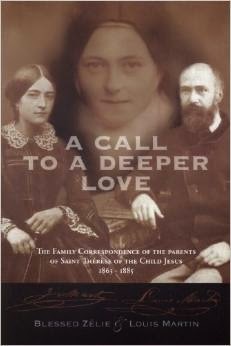 Vade in Pacem: "A Call to a Deeper Love"
A Call to a Deeper Love: The Family Correspondence of the Parents of St. Thérèse of the Child Jesus, 1863-1885. Welcome to the world of Blessed Louis and Zélie Martin of Alençon, the parents of St. Thérèse of the Child Jesus of the Holy Face. In 218 letters, Zélie, writing between the ages of 31 and 45, writes the story of the family that gave birth to Story of a Soul, the memoir of her daughter, the saint. Here Zélie shares herself unreservedly: happy as a wife and mother, overwhelmed with responsibility as a business owner, saddened by the deaths of her parents and four of her children, sensitive to slights and indifference, concerned for her surviving daughters, longing to become holy. When she is diagnosed with breast cancer, in the midst of a very human desire to live, she shows us how to abandon ourselves to God in the face of death. Only 16 letters from Zélie’s husband survive, but she introduces us to the younger Louis Martin before he suffered from Alzheimer's disease and was interned in a psychiatric hospital. Here we see him as never before as husband, father, and friend; we accompany him in the years before he consummated his ultimate self-gift. In beatifying Louis and Zélie in 2008, the Church recognized a fundamental reality: that both spouses experienced severe traumas, but the effects of these traumas were no obstacle to their sanctity. Zélie and Louis accepted their own powerlessness, that God might be all-powerful in their lives. The transforming influence of their daughter Thérèse on human history was the fruit of that acceptance. Reading about their profound love for each other and for their children and about the deep faith they lived painfully in the midst of many ordeals is a source of liberation and healing. Louis and Zélie offer us a personal experience of the motherhood and fatherhood of God. The book is a mirror of the human face of holiness. In Story of a Soul Thérèse wrote a new chapter in the history of the human response to divine love. Zélie and Louis wrote with their lives a new chapter in the history of the vocation of marriage: the extraordinary response of two spouses to the call to mirror the face of Christ to each other and to create a family that was a crucible for sainthood. A Call to a Deeper Love offers a unique understanding of a couple who became holy in and through their marriage, and it immeasurably deepens our understanding of the influences that surrounded St. Thérèse. A Call to a Deeper Love is a translation of Correspondance familiale 1863-1885, Zélie et Louis Martin, the definitive edition of these letters published in French by Editions du Cerf in 2004. The preface, the notes, and the presentation are the work of Bishop Guy Gaucher, O.C.D., retired auxiliary bishop of Bayeux and Lisieux and distinguished scholar of St. Therese, and of the Carmelites of Lisieux.